In this year of unlimited Darwin (and who better than one of the genuinely good eggs amongst great thinkers with whom to spend the next twelvemonth? ), a couple of noteworthy projects. First, over at the Borg Scienceblogs, John Whitfield is doing a crash read of The Origin of Species: the whole book plus sixteen blog-essays in 33 days. His first, on the introduction, is up now. This is something I’ve been putting together for a while, and while it too is a kind of blog of The Origin, it is really an attempt to build an ecosystem of ideas and materials around the book. I’m going to keep the details under wraps just now as we finalize design and other matters, but the project will bring together Darwin’s text with writing by a community of bloggers, along with as much material we can find from before, during and after Darwin’s times. Put it all together and the project will, I hope provide new paths into what Darwin said, to whom he was speaking, against who and what he was arguing, and the process in every generation since of creating our own Darwin with which to engage. That community of bloggers is still coming together, but those who have already signed on are something of an all-star lineup. Conversations are underway with more great people, to be named as the pennies drop. It should be great fun. I hope to see y’all along for the ride. 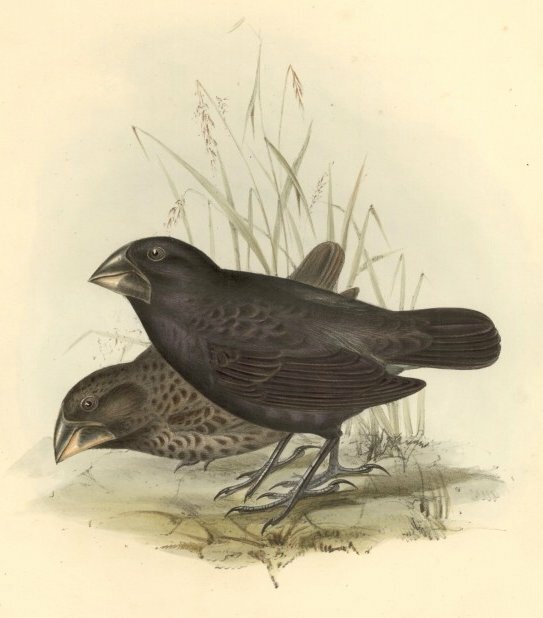 Image: John Gould, “Geospiza magnirostris” — Large Ground Finch. Illustration for Darwin, C. R. ed. 1839. Birds Part 3 No. 4 of The zoology of the voyage of H.M.S. Beagle. by John Gould. Edited and superintended by Charles Darwin. London: Smith Elder and Co. This entry was posted on January 9, 2009 at 5:44 pm and is filed under Darwin, Uncategorized. You can subscribe via RSS 2.0 feed to this post's comments. You can comment below, or link to this permanent URL from your own site.